All members should have received notice of the AGM and copy accounts with the recent issue of "Outlook". Any member who would like a copy of the notice and accounts in an easier to read format can obtain a copy from the Secretary, David Petterson. Email him if you would like another copy. 24278 recently made a rare appearance outside of Rothley shed. 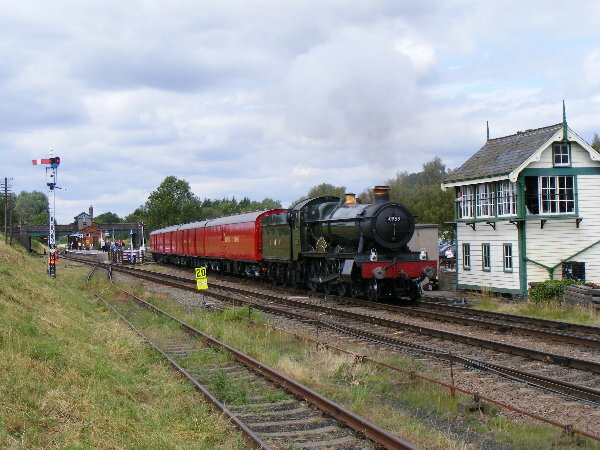 Despite not being complete 24278 made its filming debut in a BBC series called “South Riding”. Although there is still much to do inside the carriage it served the purpose of external viewing. Keep an eye out for it when it airs on BBC in the future, we will of course do our best to let you know when this is. The AGM of RVP will be held this year on 27th November and will be in the GCR board room in Lovett House, Loughborough, starting at 1030am. All RVP members welcome. BEAVERTAIL ON TOUR 2010 Part 2 - Our Beavertail Observation Car 1719E, which is currently on its summer holidays at the Battlefield Line, is in demand. Subject to contracts being signed, the coach will now be going on loan to the Churnet Valley Railway in November to take part in their planned Gala and opening of a new extension. 26th JULY 2010 - 1V86 MAKES ITS DEBUT! 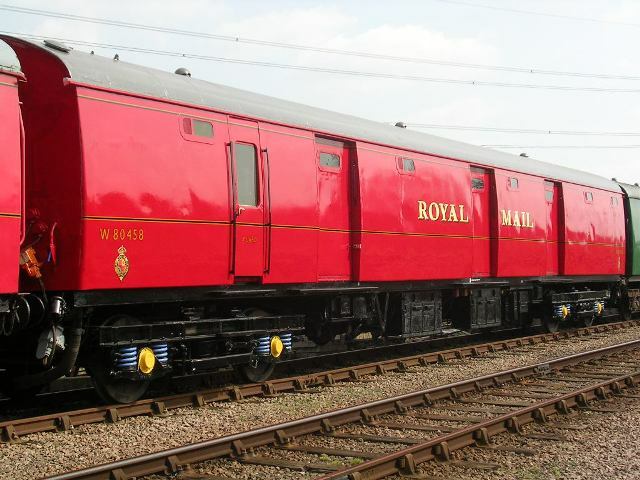 The complete mark 1 TPO set, immaculate in 1960s Royal Mail red, made its debut as planned during last weekends gala event. 26007 bringing the set into Loughborough prior to the first run. Unfortunately the 26 had a minor brake problem and it was quickly replaced by D8098 for the first mail exchange on the Saturday. Nevertheless the delay was minimal and the TPO crew (and restoration team) are seen, prior to the first run, in Loughborough yard. Other than this minor loco change all 8 of the mail exchanges ran as planned. GNR 1744 on a postal run. 4953 "Pitchford Hall" on one of the postal runs. Most appropriately, 1960s liveried Deltic, D9009, laying its own smokescreen over the exchange equipment. Our thanks to all who have supported our appeals to get the mark 1 TPO set to this stage; it really does make a striking sight and will no doubt become an increasingly popular part of GCR events. Our thanks also to the GCR operating team for putting on another magnificent display of a busy main line railway. Finally thanks to our young assistant, who single handedly wheeled the mail bags back to Quorn station after each exchange, and who refused all offers of assistance from the regular team! 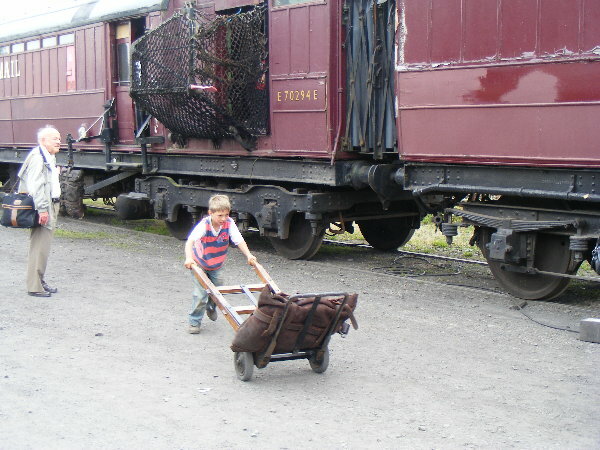 (Seen passing the LNER TPO set in Quorn yard, which was open for display throughout the weekend). MAIL BY RAIL 2010 - LAUNCH OF THE COMPLETE "1V86" MARK 1 TPO SET - July 24th/25th sees our major gala on the Great Central Railway. This year is particularly significant as the complete mark 1 TPO set will make its debut; all four coaches are now repainted in 1960s livery (but we're deliberately not putting a photo of them together on here until after the gala!). They will perform four mail exchange runs each day, with an extra one on Saturday night. Locos used will include a visiting Deltic and "Pitchford Hall". The GCR will be operating an intensive passenger service and our LNER TPO set will also be on display at Quorn. For full details of train times and fares see the GCR WEBSITE. BEAVERTAIL ON TOUR 2010 - Our Beavertail Observation Car 1719E has gone on its summer holidays; this year to the neighbouring BATTLEFIELD LINE. It left the GCR this week and is expected to operate every weekend until 6th September (see the timetable on their website). The Battlefield line is home to LNER B1 1306 "Mayflower", which was resident on the GCR in the 1980s and ran with the Beavertail last year at Llangollen. If you are visiting the GCR this summer do also consider making the short trip across Leciestershire to see some different scenery out of the observation windows. 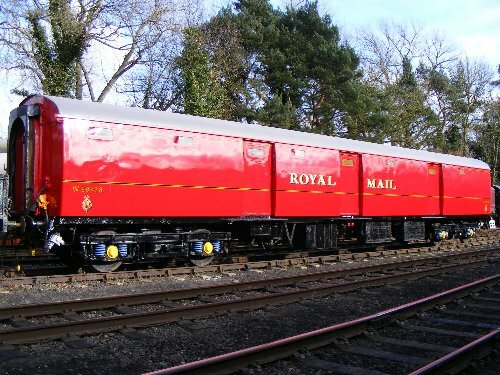 TPO UPDATE - We are pleased to report that the appeal to purchase Post office Sorter No.80301 was successful; the vehicle is now in RVP's ownership and its continued service in mail exchanges on the GCR is assured. 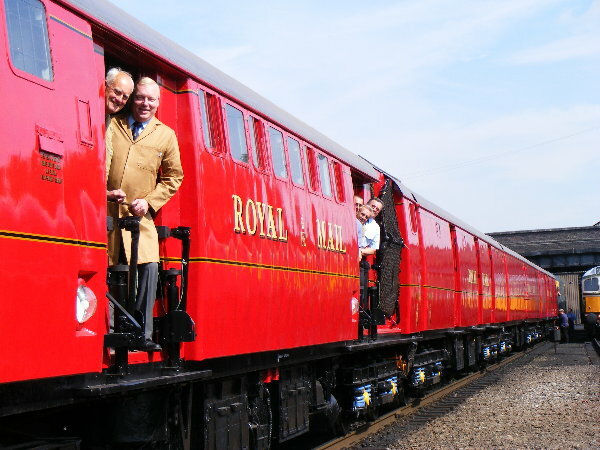 Our thanks to those who have donated, Museums, Libraroes and Archives (Science museum; who provided £4,000 towards the purchase), and to Alan & Tracy Lear (who initially bought the vehicle for use on the GCR and placed it on loan to us 10 years ago). BUT DON'T PUT YOUR CHEQUEBOOK DOWN YET! 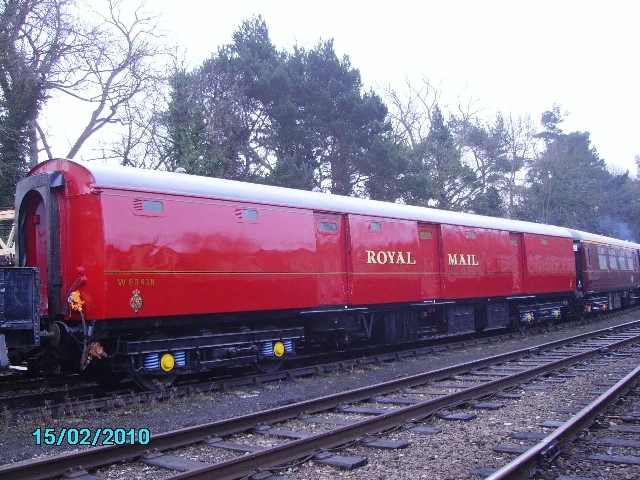 As you may know, our other three TPO vehicles (80349, 80438 and 80458) have all recently recieved repaints in 1959 Royal Mail livery (see below). While 80301 has carried this livery since 2001 it was overdue for a repaint. To maximise the impact of the whole train appearing in ex-works condition the decision has been taken to repaint 80301 too, before the July gala. We therefore need to raise a further £2,000 to cover this - work has already started in anticipation. The complete set will make its debut in the Mail by Rail gala - JULY 24/25th - at which there will be frequent mail exchanges using the Mark 1 set. 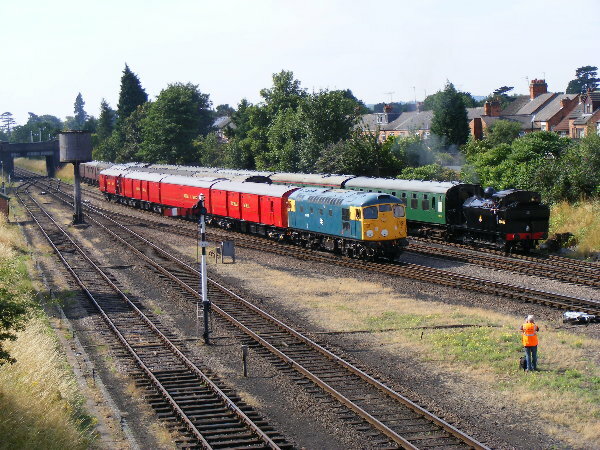 The appearance of a complete ex-works TPO train will be striking (and a first in preservation); make a date in your diaries, but also consider sending a cheque to help out (payable to RVP Ltd, with 80301 on the back, to 26 Cliff Park Avenue, Wakefield, WF1 2DW). 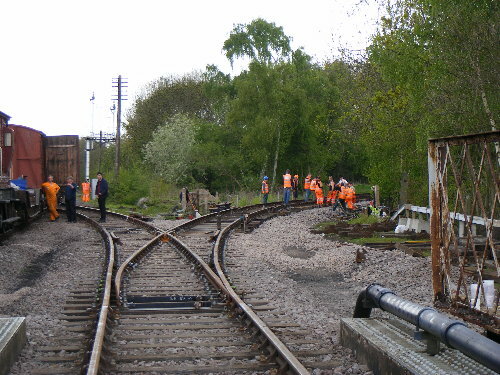 14th MAY 2010 - THE MOUNTSORREL BRANCH IS BACK!!! 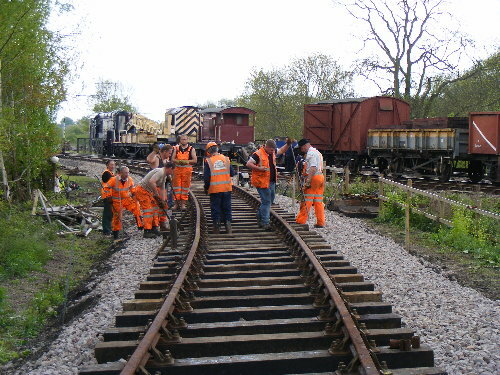 We don't generally post updates on the project to restore our section of the former Mountsorrel Railway on this page now - leaving it to the team running the project to provide comprehensive news on the project's web page at MountsorrelRailway.org.uk. However we cannot let news as significant as this pass us by - THE BRANCH IS BACK! During the workweek this week the junction point at Swithland, the associated trap point, and the first section of the branch itself has been relaid. This is an impressive junction involving a specially constructed curved point nose and associated constant curve as the branch sweeps away. The track now extends over the GCR / RVP boundary, with approx 150ft of track now laid ont he RVP section - the first time in RVPs 42 year history that we''ve had our own stretch of railway!! Of course this is just the start - we urgently need more funds as this is now the only thing stopping the branch from reaching the end of the prepared formation 3/4 mile away. 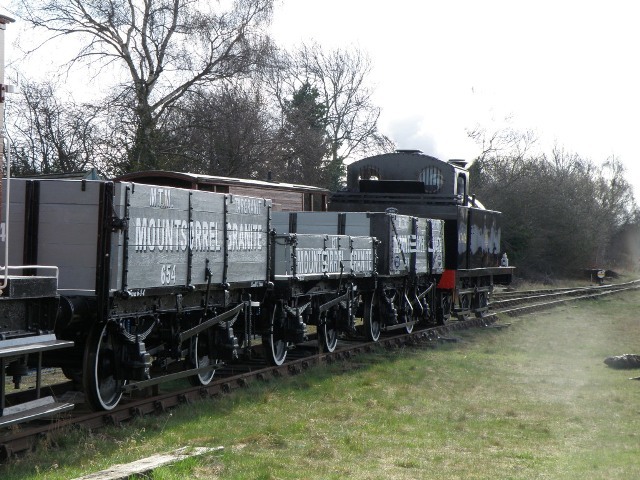 See the Mountsorrel Railway page for full details or just send a cheque payable to RVP Ltd (with Mountsorrel Rly on the back) to 26 Cliff Park Av, Wakefield, WF1 2DW. We must record our sincere thanks to the GCR Permanent Way team who masterminded the relaying of the junction and have provided considerable assistance and guidance this week. 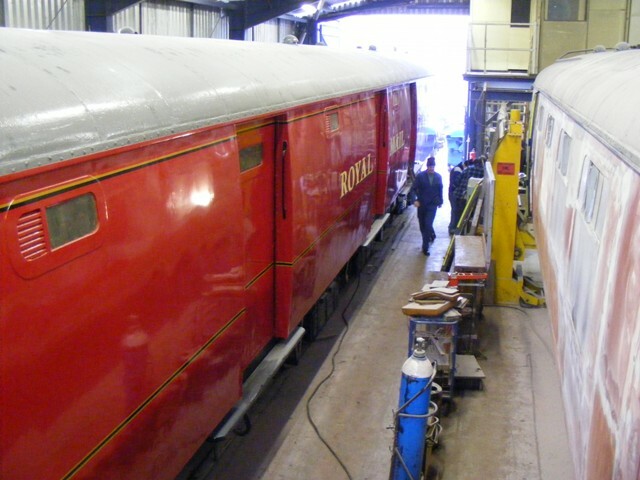 Restoration progress - The heavy restoration of Gresley buffet car 24278 is now approaching completion. The interior is the focus of intense activity and is now taking on an appearance similar to its original 1937 styling - as these photos show. The decor gives an clean and open look to the saloon, if somewhat cold. The similarities with the original interior colour scheme of the Beavertail cars built at about the same time is also clear. Obviously Mr Gresley liked blue! Work is now focussed on the kitchen. It is expected the completed vehicle will makes its passenger debut later in the year, and the GCR's teak carriage shed will slowly start to take shape (Brake pigeon van 4050 already running in this style). SECOND TPO COMPLETED - the restoration of Mark 1 Brake Post Office Tender No.80458 is also now complete, and it has emerged from Rothley shed in full 1960's red livery to match 80438 (see below). 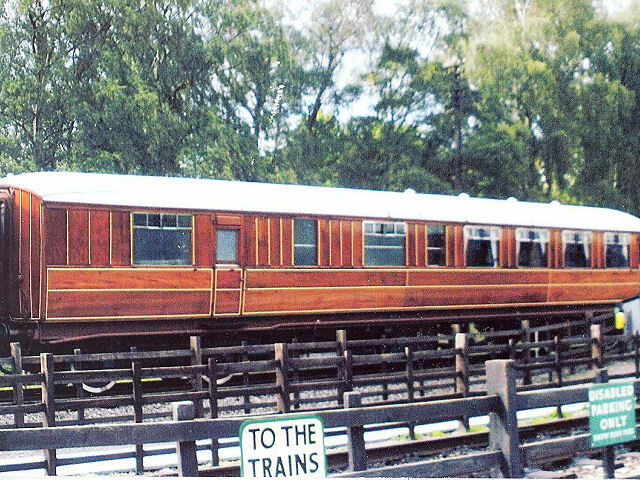 It is seen stabled at Swithland. The third repaint, 80349, is now well underway. The first appearance of the complete train in this colour scheme will be in the July Mail by Rail gala (24/5th) - when the four coaches in this livery will make a striking site. To keep this special we're deliberately not showing a photo of the vehicles together until that weekend! This weekends GCR gala saw mail exchanges with "Tornado", but also saw the first runs of all three restored Mountsorrel Granite wagons in a freight train. 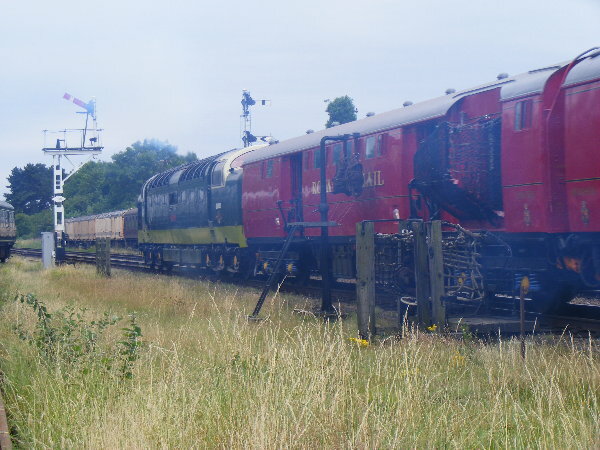 The photo shows 47406 picking the wagons up from the siding at Quorn for a trip up the line. DAVID MOULDER - It is with sadness that we have to report the death of Dave, earlier this month. Dave was one of several RVP members who were real TPO men, having spent his working life on the mail network until it ended in 2004. He then joined RVP and continued to work our TPO trains with some of his former colleagues. We are proud of the fact that those involved with this unusual line of work in their careers are able to consider our current recreations sufficiently close to the real thing to be able to feel fully at home. Dave was able to describe TPO work in the way that only those closely involved could do; this helped immensely in making our TPO trains the important part of living history that they are. Dave was due to be on duty during the mail exchanges taking place on the GCR this weekend so the loss will be particularly felt this weekend. Our sympathy to his family at this difficult time. Post Office Sorter 80301. 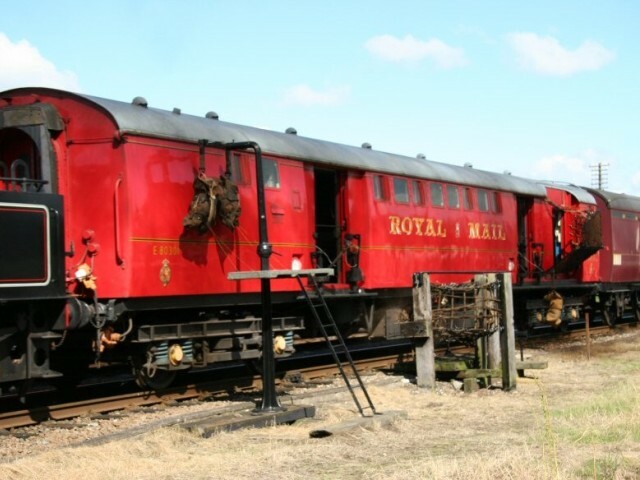 This Travelling Post Office vehicle has been in our care for ten years and is an essential part of our "1V86" Mark 1 TPO train; it has the exchange equipment fitted and has been in its original 1959 livery since 2001. 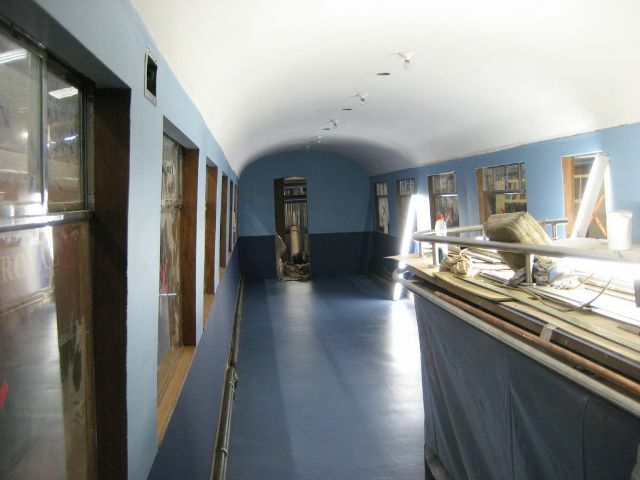 OIt was purchased for preservation by two RVP members and placed on long term loan to us. Unfortunately one of those owners is now seriously ill and the vehicle needs to be sold. RVP was offered first refusal and we have reached an agreement to buy. Furthermore we have successfully obtained a sizeable PRISM grant through the Science Museum towards its purchase. However we nedd to raise the rest of the purchase monies (and hopefully some excess to fund a repaint now due) immediately. We need £4,000 to ensure 80301 remains with us in full operating condition on the GCR. If you have enjoyed watching it perform mail exchanges please make a donation - cheques payable to RVP Ltd and with 80301 written on the back; sent to 26 Cliff Park Avenue, Wakefield, WF1 2DW (please indicate if you want a receipt). Round the other side, the team adding the Finishing touches. The first of our mark 1 TPO repaints is now fully complete. Tender vehicle 80438 is seen outside Rothley shed completed with lettering and lining. Sister vehicle 80458 is now in the shed recieving the same treatment. UPDATE - The first Mark 1 TPO to recieve its repaint, 80438, is now virtually completed as this photo Shows. 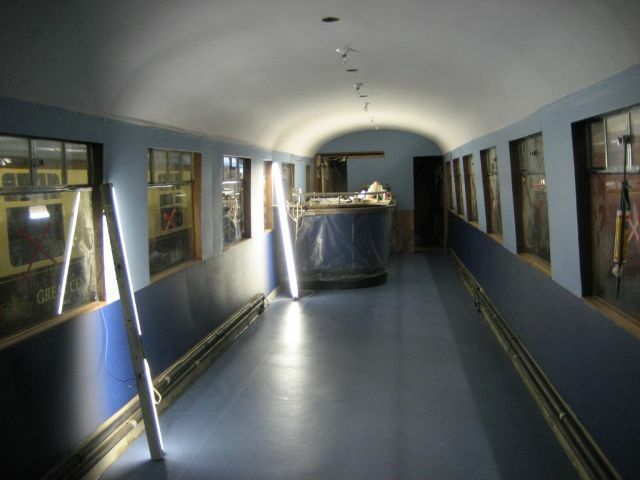 Final varnishing will be complete shortly, but the intention is not to return the vehicle to traffic until the full set of four vehicles is ready for unveiling together at the July "Mail by Rail" gala. Next vehicle into the shed for a quick repaint will be six wheeled brake van (BZ) 70654E - expected to take only a couple of weeks, after which the TPO repainting will continue with 80458. 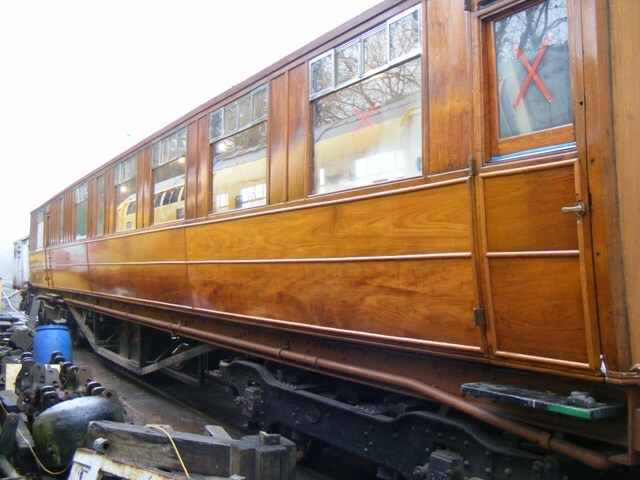 Also very near completion is teak buffet car 24278 - this is now outside the shed, but will go back in again shortly for final lining and varnishing. 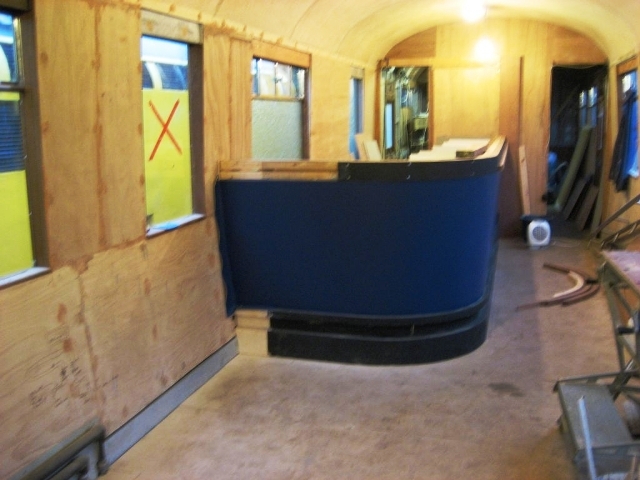 The interior work is also rapidly taking shape and the vehicle will return to service by this summer. UPDATE - The gala weekend was very successful; the two mail trains each day operating without problems (and with spectacular perfromances from locos Leander and Oliver Cromwell). 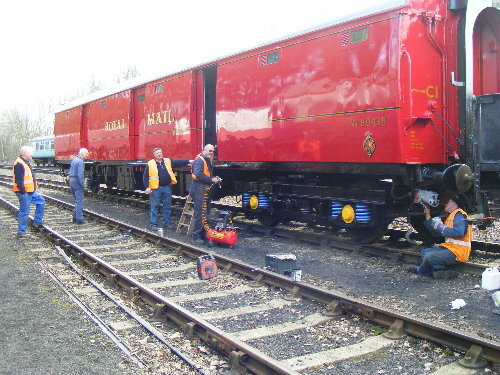 The train operated with just three carriages; 80438 being on display in Rothley shed in its new coat of Royal Mail red livery. This had been completed the week before and is now having the lining and lettering completed. The next TPO vehicle in for a repaint is expected to be 80458. 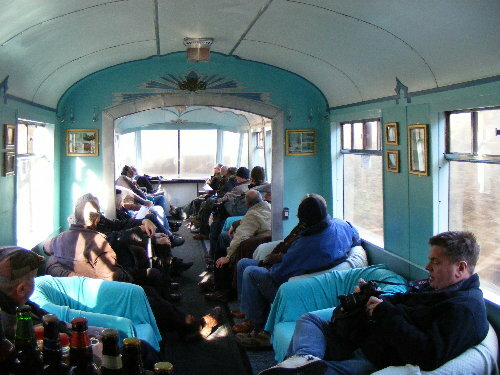 The Beavertail car operated on a total of 11 round trips; all but the first and last each day being full to capacity as this photo shows. Also at Rothley over the weekend and visible from passing trains (but sadly not accessible to those visiting the shed) was teak buffet car 24278. This is now rapidly nearing completion and interior work on the bar and buffet counter is now progressing well. This vehicle is almost certain to enter service this year. Finally our annual meal was held at the GC Hotel on the Saturday night; 40 members joining us with several doing their best to drink the bar dry! 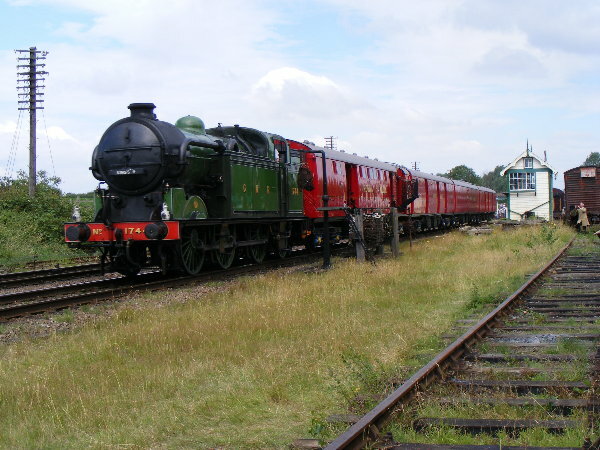 GCR WINTER GALA 30&31st JAN - this coming weekend sees the GCR winter gala, with an LMS theme. As usual the TPO set will be out; mail drops at Quorn at 10:33 and 4:33 each day. The BEAVERTAIL will also be in use - supplement of £3 per round trip to use it. Rothley shed will be open, and contains the first of our repainted TPO vehicles, 80438, currently awaiting lettering and numbering to complete it. Also in the shed is the third Mountsorrel Granite wagon undergoing restoration. The sales and display stand will also be out. RVP ANNUAL MEAL - Our annual meal will be held on Saturday 30th Jan 2010 at the Great Central Hotel, Loughborough - £17 per head for the three courses and coffee. Places are limited so please contact darren@rvp-ltd.org.uk as soon as possible if you wish to reserve a place. This is the Saturday night of the GCR winter gala - at which there should be two TPO runs each day, the Beavertail running and probably Rothley shed open for visitors.